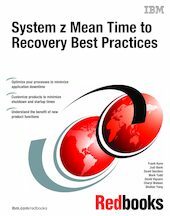 This IBM® Redbooks® publication provides advice and guidance for IBM z/OS® Version 1, Release 10 and subsystem system programmers. z/OS is an IBM flagship operating system for enterprise class applications, particularly those with high availability requirements. But, as with every operating system, z/OS requires planned IPLs from time to time. - Minimize the application down time that might be associated with planned system outages. - Identify the most effective way to reduce MTTR for any time that you have a system IPL. - Identify factors that are under your control and that can make a worthwhile difference to the startup or shutdown time of your systems.